Prepping your horse for a first ride requires plenty of ground work. Here are your step-by-step instructions. When you’re gonna be the first to sit in that saddle, you’ll want to do everything possible to stack the odds in your favor. Today we train your horse to accept the bit, bridle and reins. In the same way that a hammer and drill can build a doghouse or a penthouse, you can use the tools you’ll pick up today to teach your horse virtually anything tomorrow. “Sacking out” means getting your horse “used to” something. That’s what we’ll be doing today, sacking out your horse, getting him used to the saddle blanket or pad, saddle and saddling procedure. Yesterday we desensitized the horse to the saddle and related gear. Today we get him familiar with the actual mounting process. Today is a big day for you. It’s more than “Honey, I rode Flicka today and didn’t get killed.” It’s also your opportunity to get your green horse started off on the right foot, er, hoof. Given that your youngster is nervous, “knows nothing,” and has the attention span of a trout, it is critical that you become practiced with your hands, your primary source of communication. 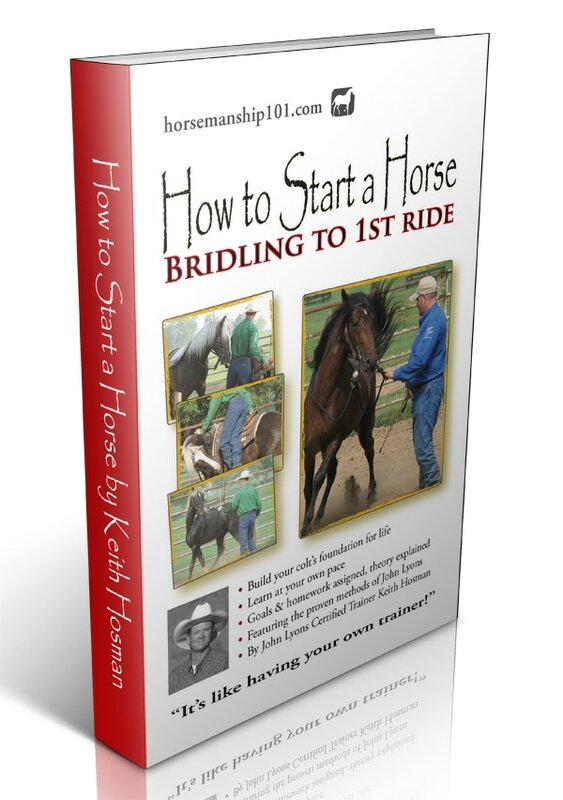 This book offers simple and objective training for the unbroke horse, from 1st-time bridling and saddling to sacking out, bridle work from the ground, pre-mount work, and your (necessarily short) first ride. Learn the proven methods of John Lyons, safety tips and tricks to save time. Put a solid foundation on your young, green horse, a solid start that pays big dividends for the rest of his life. This book provides simple and objective training for the unbroke horse, from first-time bridling and saddling to sacking out, bridle work from the ground, pre-mount work, and your (necessarily short) first ride. You'll learn the proven methods of John Lyons, tips to keep you safer, and tricks to save time. Today's the perfect day to get started putting a proper foundation on your horse, a solid start that'll pay big dividends for the rest of his life. • If you haven't round penned your horse, you can still begin with this book BUT round penning beforehand is highly recommended. We'll get you into the saddle for a first ride -- and finish up with a chapter designed to prep you the rider/trainer, for all future rides, demonstrating specifically how to use your reins for quicker, easier results with horses of all ages. A good ninety percent of the issues I see at a typical riding clinic could have been prevented if the rider knew a few simple rules about how to hold (and release!) those reins. Developing a "good feel" for when and how to pick up and drop those reins will make training easier at all stages of your horse's life -- especially when astride a young and nervous colt when clear communication is most paramount. Finally, pinned to the tail of this book, you'll find "Cinchy Horses." Should you find yourself training a youngster who's especially goosey at the tightening of the cinch, you'll want this "what to do" fix. 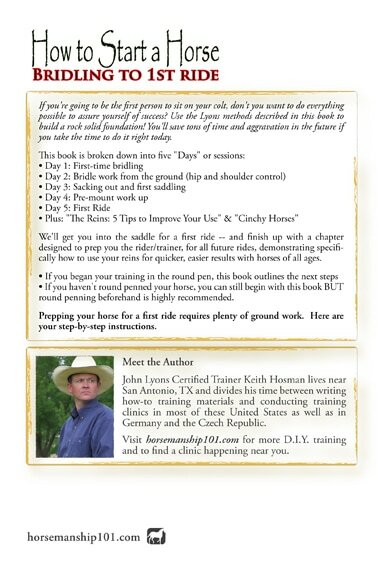 Though not a mandatory prerequisite, round penning your horse (using the methods of John Lyons) is the smart thing to do before completing the material in this book. Ideally, your horse is now relaxed around you, leads well, has been taught to turn away from you as well as to face you (consistently keeping two eyes on you), and is wholly desensitized to your hand and various objects. At an absolute minimum, your horse must remain calm and willing in most circumstances when being worked with (today), is thoroughly "used to" being handled, and you must have the ability to turn the horse toward you as well as away. You must be able to lead your horse, he isn't head shy, and you can handle his entire body, ears, and all four feet. If not, check out the prerequisite work found in my book "Round Pen: First Steps to Starting a Horse." • "The Reins: 5 Tips to Improve Your Use"
What this book does not cover: It's loaded with early-stages training for the green horse - but it does not cover elementary sacking out (again, see my book "Round Penning: First Steps to Starting a Horse"), nor does it offer training beyond the first few weeks after first saddling up. It teaches you hip and shoulder control from the ground, how to bridle and saddle up for the first time and what you need to do to take the first ride - which will necessarily be a short one. It gives you pointers as to how you should further your training (beyond the parameters of this book) but it does not cover "riding training" (turning, stopping, speed control, etc.) beyond lessons recommended for your first dozen or so "rides."